This fish curry could be prepared in a matter of 15 minutes. Easy and tasty. Goes well with rice as well as Kappa (tapioca). But i love this spicy curry with kappa. Tangy, spicy, easy and healthy fish curry prepared without coconut. Kudampuli is a kind of tamarind widely used in Kerala to obtain the authentic taste. I would recommend for using Kudampuli if you would like to retain the authentic Nadan taste of this curry. This curry could be prepared with normal tamarind used for curry as well. Heat a pan and add oil. Add onions if you wish and cook till slight brown colour. Subsequently add ginger garlic paste and allow to brown slightly till the raw smell goes. Reduce the flame to simmer and add the fenugreek powder. Then add the chilli powder and allow to cook the chilli powder in that same oil for a moment. Don’t allow to cook more than a minute if you do so the masala will burn and the fenugreek would turn bitter. Immediately add a glass of water, kudampuli and salt; allow to boil. When the oil from the curry starts to separate, add the fish and reduce the flame to medium. 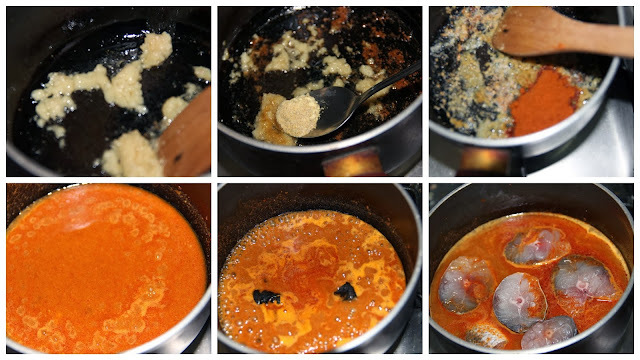 Allow the fish to cook simultaneously reducing the curry and allowing the oil to separate. Add curry leaves and put out the gas. Note: Don’t add more water. Because in this curry the thickening agent is fenugreek. Other than that we are not adding coconut or another agent to make the curry thick. Hi Lincy, fish curry looks delicious. New to ur space and following you too!! very healthy and delicious fish curry..